Guess what comes after the dreadfully cold winter? Answer: The happy, colorful, scented spring, of course. And everyone loves it, right? Then, why don’t you set the scene for spring with a vivid tablescape and invite some of your closest friends for dinner? Whether it’s a fun floral composition in a rustic vessel or a simple table setting with flowers, find an easy and affordable way to celebrate the beauty of the season. Let’s start with an easy one! 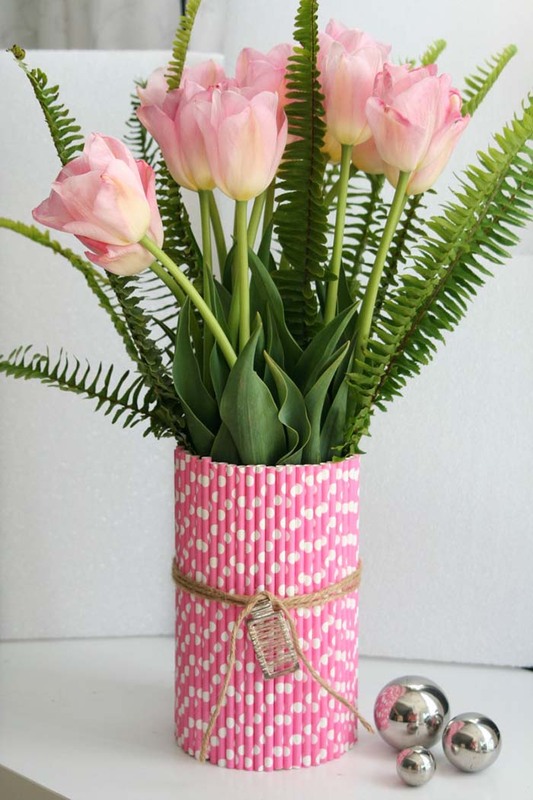 You only need some fresh spring flowers ( or faux flowers ) and tin can. You can spray paint the can or get one in a turquoise color like I did. Then you just need to arrange the flowers the way you like it. 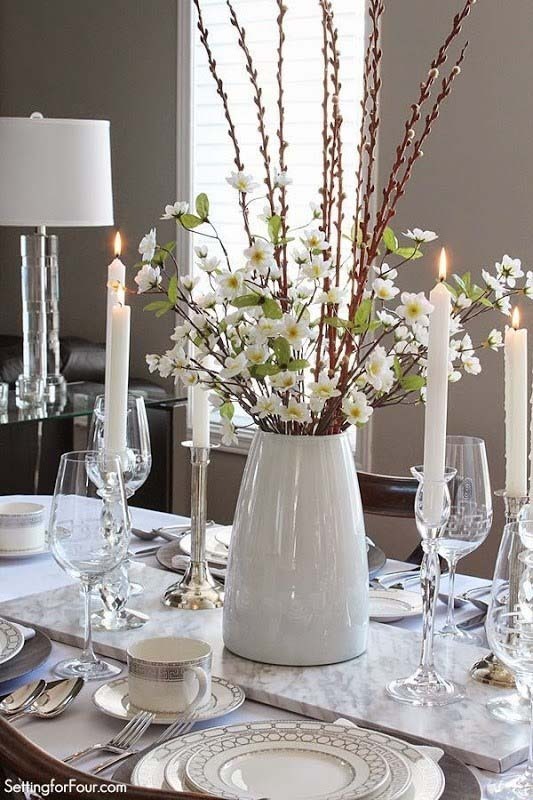 I’m sure lots of you prefer the simple spring centerpiece ideas that don’t weight down the whole interior. 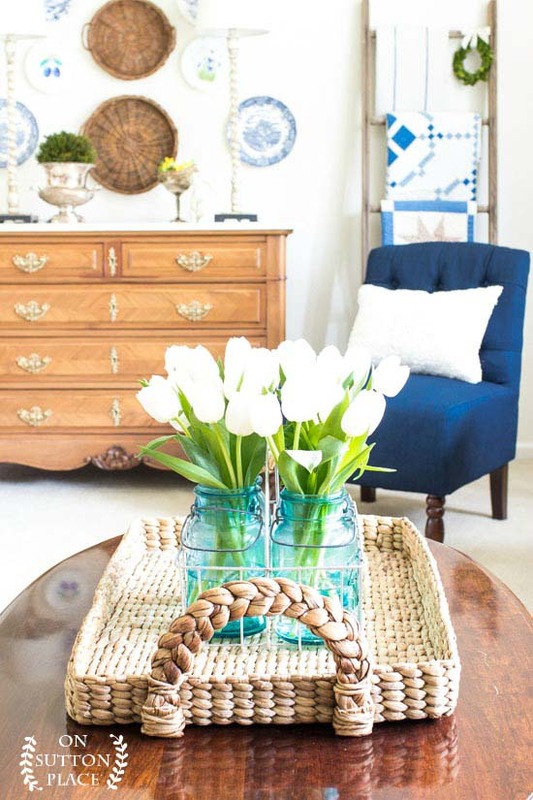 If there is an old wooden drawer lying in the garage without cabinets, it could be easily remodeled as a flower holder. 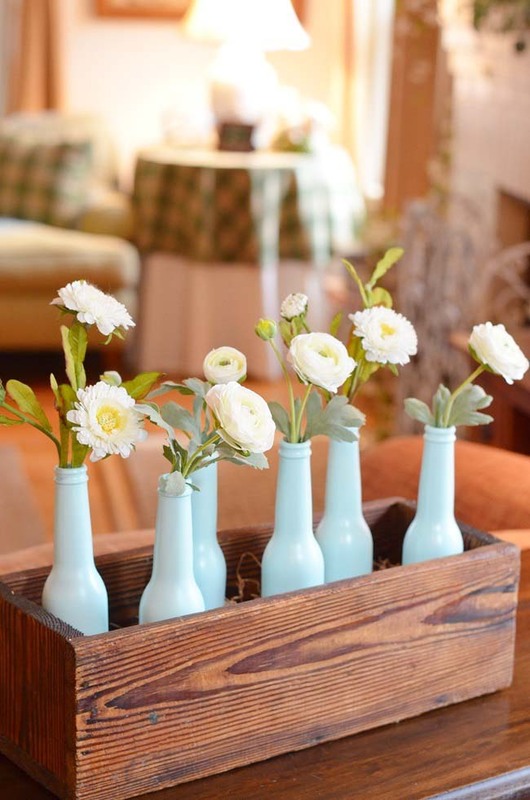 I suggest to arrange a few stems of spring flowers in painted glass lemonade bottles and place them inside the drawer. 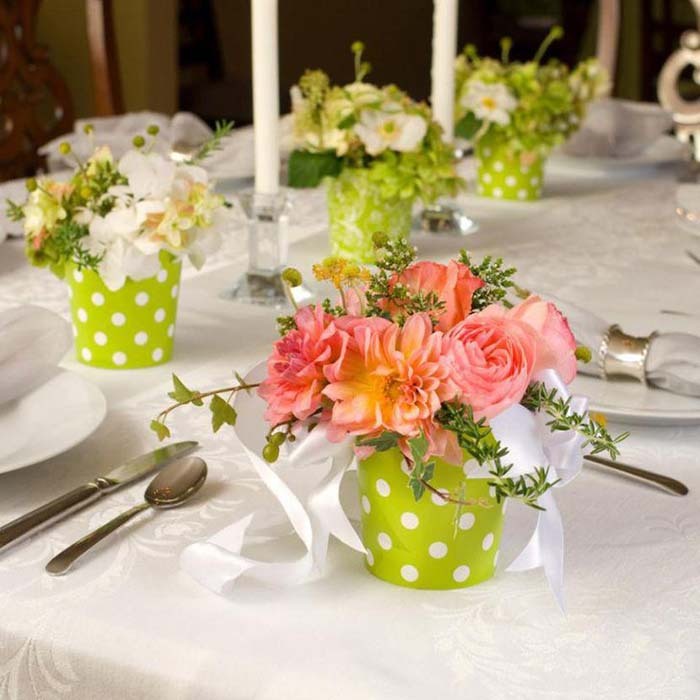 This is one of my favorite spring themed centerpieces because it brings a joyful, fun vibe to the dining table thanks to the colorful flowers and the dotted vases. Also, it is not too large and showy so it won’t steal the rest of the decor’s thunder. 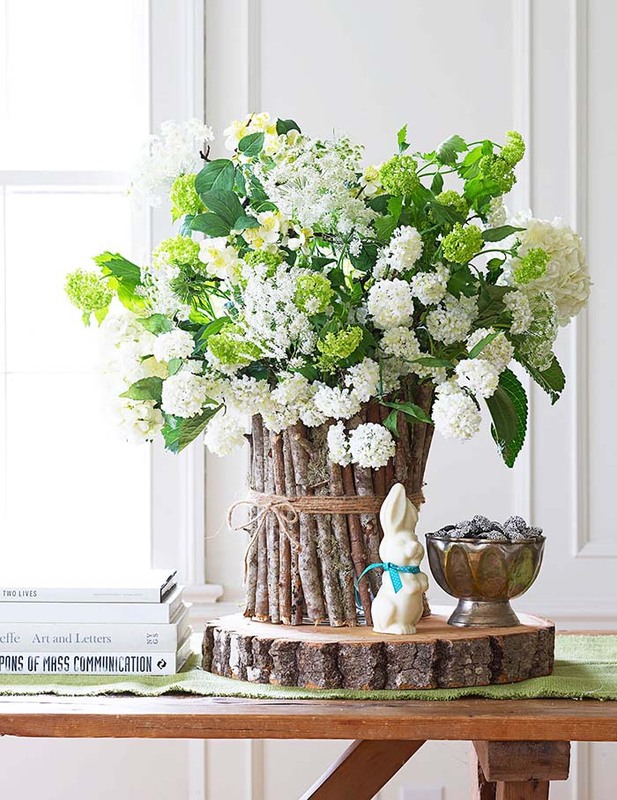 The woodsy vase reflects these country-garden vibe of the Hydrangeas. The cute ceramic bunny adds some extra charm to this table setting. 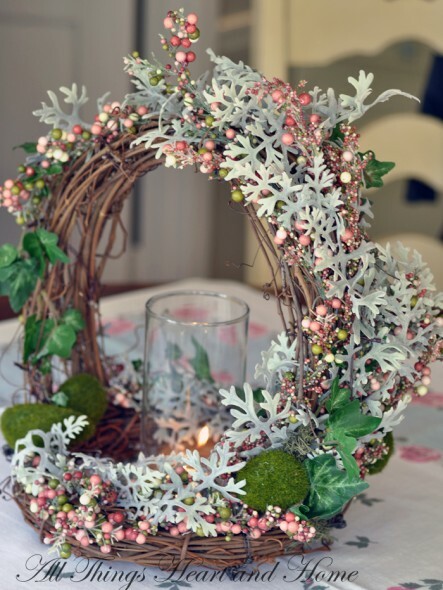 By the one, this is one of the spring floral centerpieces that you can freely re-create for your Easter dinning table. 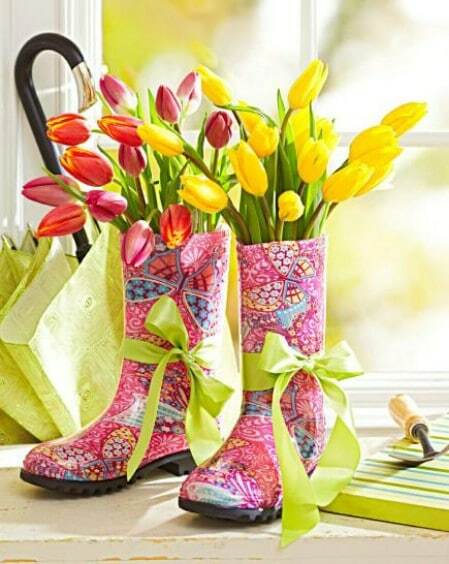 Arrange some of your most favorite flowers in a pair of your kid’s old colorful rain boots. 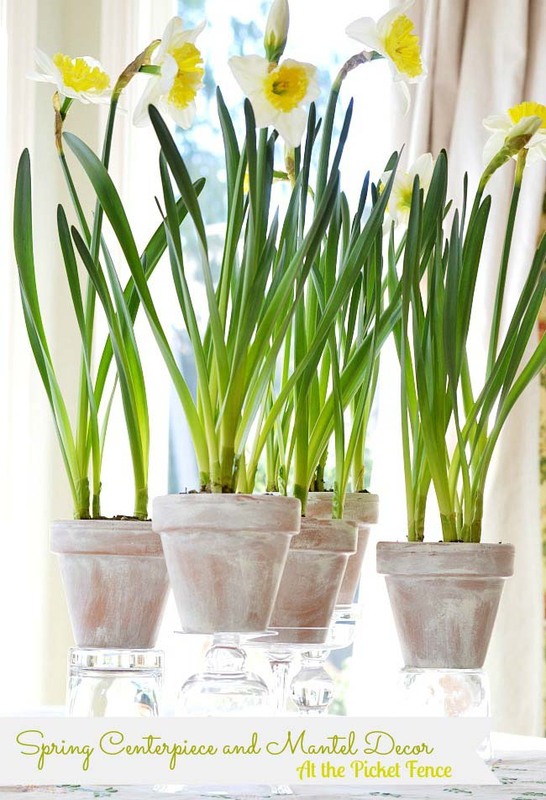 If you are browsing for some affordable and easy spring centerpieces, this o e may be the right answer! Moreover, it’s joyful and you can combine as many colors as you like. When you decorate the house for the upcoming spring, you should know there are tons of great spring centerpieces without flowers out there. 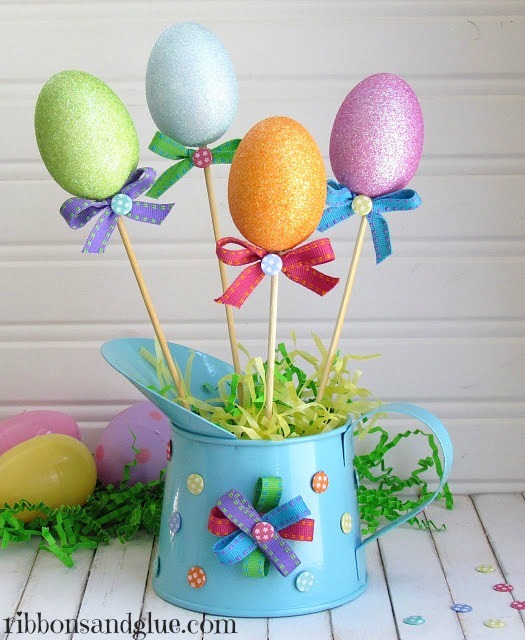 This one, for instance, costs less than $5 and all it needs to be made is a bunch of faux glittered eggs, some ribbon and messy Easter grass. 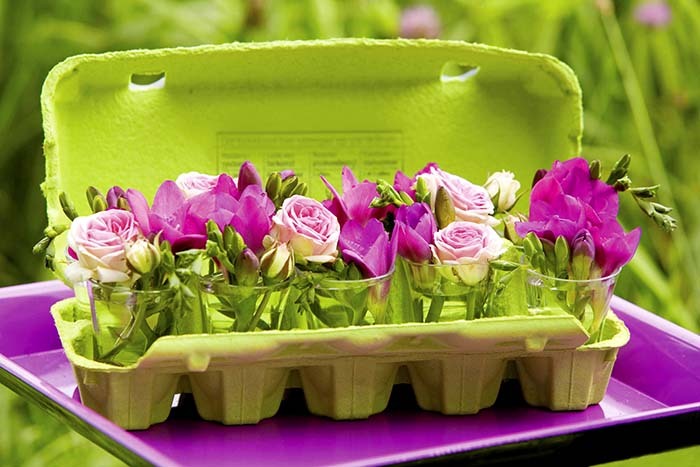 This egg carton, painted in green, is the ideal container for carrying small bunches of spring flowers. Why don’t you let a few of these spring table centerpieces decorate your table this season? Hint: Instead of egg carton, you can also use a paper rasberry basket. 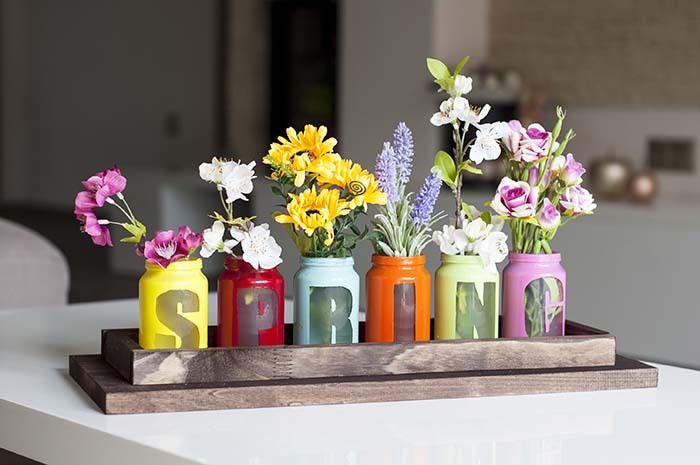 This cute spring centerpiece is made with mini jars, spray paint and faux flowers. In this lively composition, a trio of galvanized containers is filled with the moss-like Baby’s tears plant. 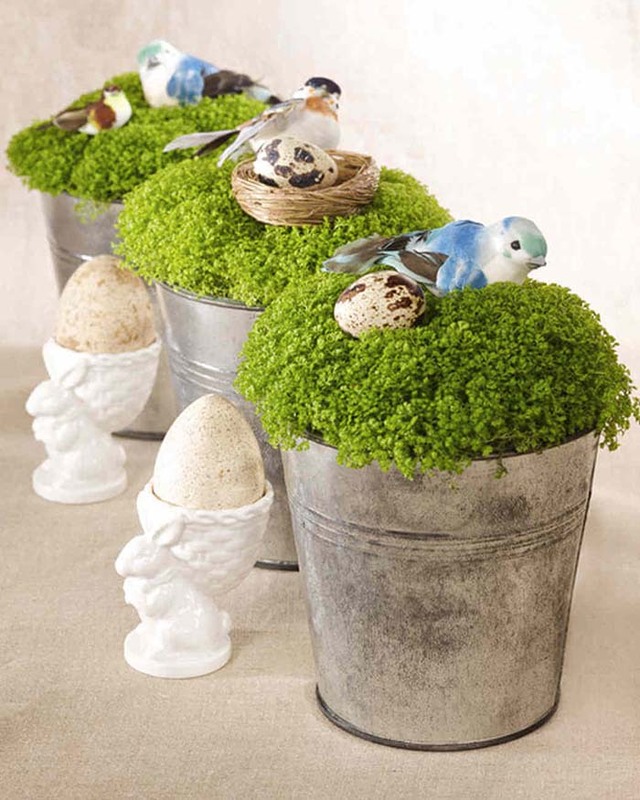 A few tiny lifelike birds with tiny nests are nestled into the greenery. What a charm! This one could be your next Easter craft project. As I am a big fan of the rustic spring flower centerpieces for tables, I decided to include this idea in my collection. 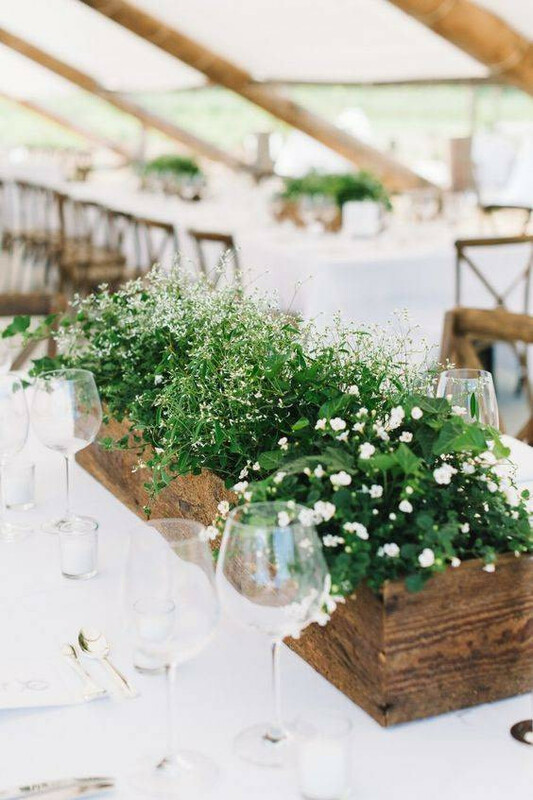 The white wildflowers and bright green fillers lend a raised touch to the rustic reclaimed wood planter. Simple and stylish. The spring candle centerpieces are always a great idea because they give an additional warmth and coziness to the dining table. 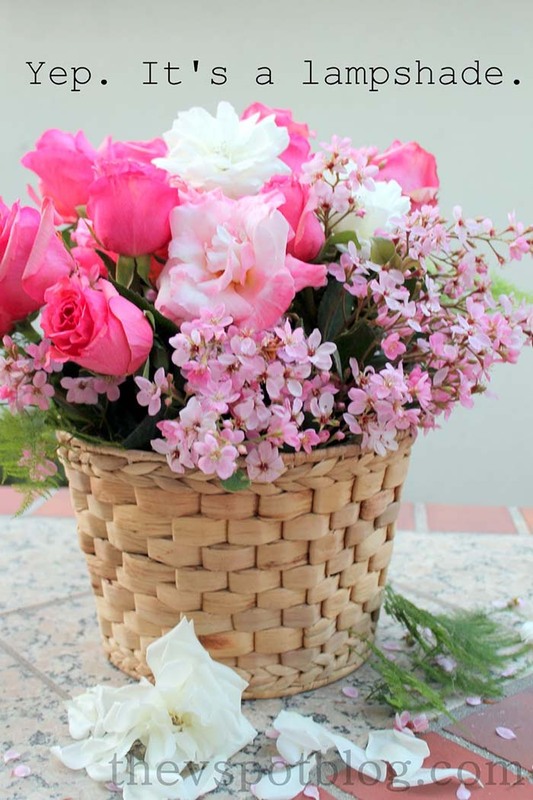 This DIY woodland basket, for instance, adds extra texture and passion which makes it one of the most preferred spring centerpieces. When I first saw this oversized Easter-themed centerpiece, I was really impressed by its size and the stylish combination of materials. It is ideal for spacious kitchen or living room spaces. Moreover, it can be displayed in the beginning of March as we as during Easter time. Calling out the crazy DIYers! 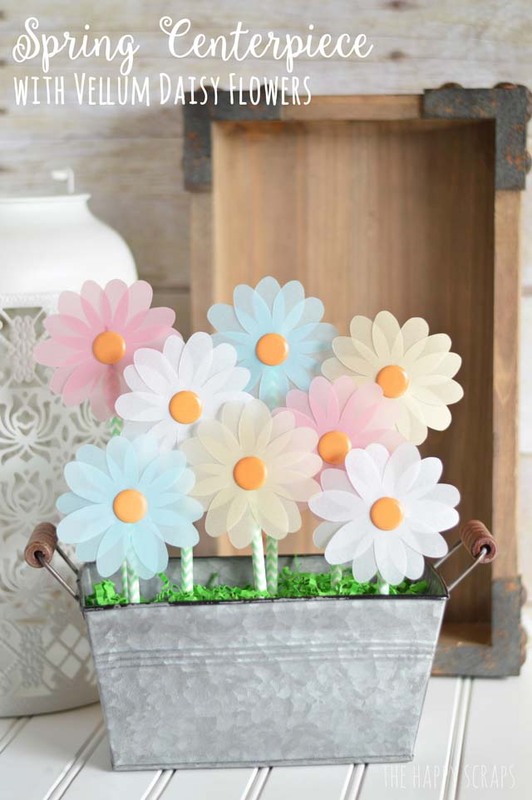 This adorable spring floral centerpiece, made of vellum and paper straws, can be a perfect reason to spend some quality crafting time with your kids. 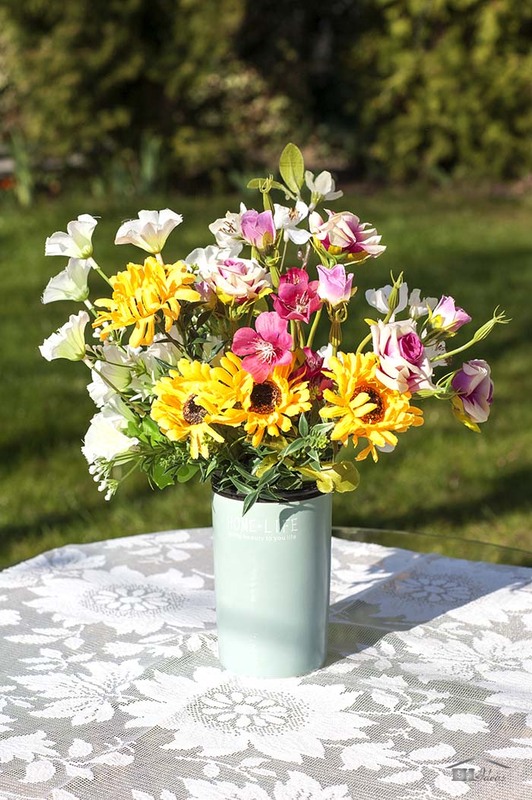 Another reason to choose this spring centerpiece is the fact it will bring lots of cheer into your home. 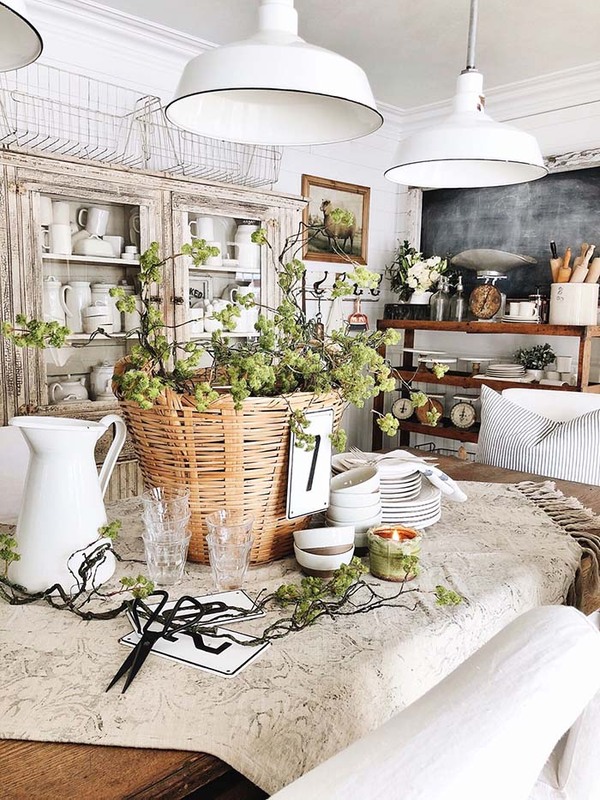 This large wood basket offers rustic balance to the dreamy, tender arrangement of vine branches. That surely isn’t one of the most popular spring flower centerpieces due to its size, however, I really love it! The daffodils are one of the symbols of the spring season. Why don’t you take a bunch of glass pieces of varying shapes and sizes to create the ideal stands for displaying them. Imagine creating eye-catching spring centerpieces for less than 5 minutes! That’s absolutely possible. Just cut some flowers from the garden so they are the same length and place them in a couple of simple jars filled with water. This beautiful temporarily floral arrangement is made of lampshade and 3 regular glass jars. It’s lively, cheerful and easy to make. Hint: You can easily customize it by displaying flowers in different color palette. Here is another of the easy centerpiece ideas (I bet you’ll love it!). Just go outside and cut a few branches full of blossoms, and put them in an oversized ceramic vase. That is all. I believe the best spring centerpieces are not the most expensive ones but the ones with an unique look. I would suggest to stuck colorful paper straws onto the side of a simple vase by using glue (as shown on the picture above). 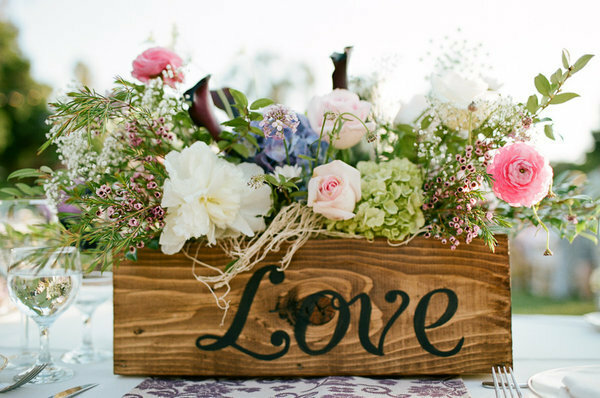 A reclaimed wood drawer with a LOVE sign is the ideal container for a lush arrangement of pretty pastel flowers, including roses, green hydrangeas, lisianthus, and more. 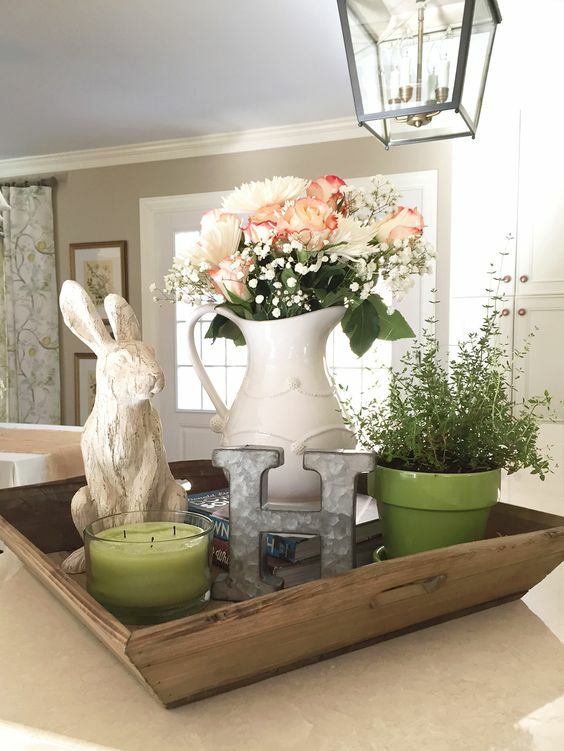 Whether you need to decorate your home for the Easter dinner you’ll host or for a spring celebration, the appealing displays, floral compositions, and spring centerpieces I just showed you, will surely add just the right touch!